In the world of artistic integrity among musicians, there are few crimes as severe as lip-syncing or miming your concerts. Comparable to being accused of not writing your own lyrics or licking donuts that aren't yours, lip syncing is often seen as a major offense against fans who were looking forward to hearing their favorite musicians sing live, only to hear a pre-recorded track that the artist mouths the words along to. The offense of lip syncing is so dire, that careers have been completely derailed when an artist is caught miming their performance (Look no further than Ashlee Simpson's SNL debacle for proof). Now that they're performing in one of the most high-profile events in the world, you have to wonder, will Coldplay lip sync at the Super Bowl or mime playing their instruments? In many cases, it could be understood why some fans would be upset to see one of the biggest bands in the world pretend to play their instruments. The Super Bowl, however, is a different story. Because of the short set-up time and scale of the performance, bands have previously mimed the acts of playing some instruments, as the San Diego Tribune reported of the 2014 Super Bowl. It's likely that Coldplay will do the same with some instruments for Super Bowl 50, but it shouldn't be held against them if they do. Bustle reached out to one of Coldplay's representatives about whether the band plans to do so at the Super Bowl, but has not received a response. The Red Hot Chilli Peppers famously played the Super Bowl XLVIII halftime show without plugging in their instruments. According to CBS News, this particular instance was requested by "NFL officials who felt it was too difficult to pull off a completely live performance because of potential sound issues." However, the draw of playing one of the biggest events in the world and collaborating with the biggest pop star in the world is surely enough of a draw that the miming of instruments can be overlooked. 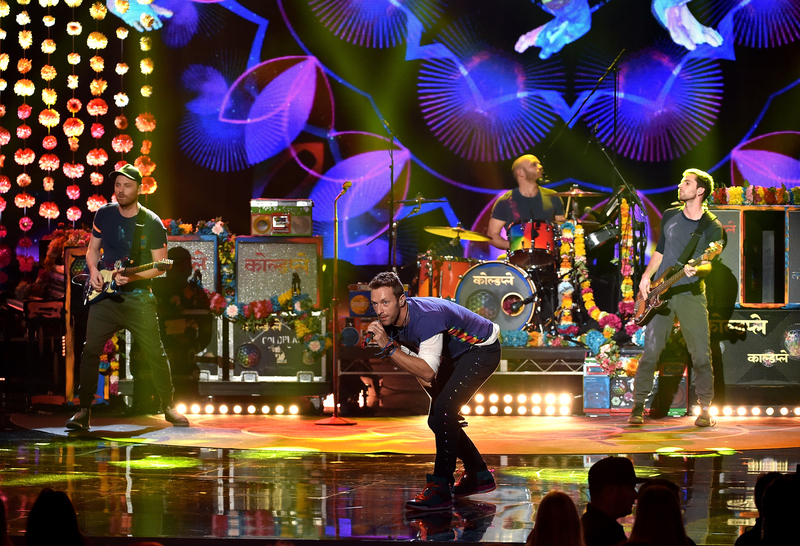 Chris Martin, however, may not have to lip-sync his vocal performance. During the Red Hot Chilli Peppers performance (which is the last time a full band has played the Super Bowl halftime show), lead vocalist Anthony Kiedis still delivered a live vocal performance, as CBS' report explains that the band's statement specified the pre-recorded track was instrumental. With this precedent, it's more likely that Martin will be singing live for the Super Bowl crowd while the rest of the band supports him by miming their instruments to a pre-recorded track. RHCP bassist Flea said on the band's website that playing the Super Bowl was akin to "making a music video in front of a gazillion people, except with live vocals, and only one chance to rock it." While Coldplay may have to keep their instruments off for their Super Bowl performance, it's still guaranteed that the band's top priority is putting on a legendary show that everyone will be talking about for years to come. It doesn't hurt that they're also working with the biggest pop star in the world. As long as Coldplay and Beyoncé have the foresight to bring back the biggest star to ever come out of the Super Bowl Halftime Show, it's guaranteed that this year's performance is going to be great, no matter how Coldplay chooses to play.